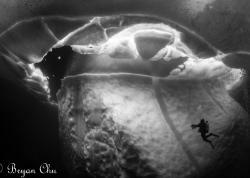 An extraordinary underwater adventure in Anilao with a lot of unique surprises along the way. 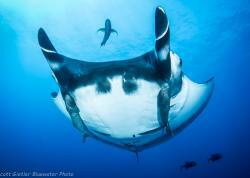 It's amazing to me how such a small place like Anilao, Philippines can host such a huge variety of critters. Each new visit brings something special, but something really spectacular happened to make this season unique for myself and many others. Occasionally a dive guide will come up to me and say “Mike, I heard a rumor.” I love when conversations start like this since I never know which way they will go. 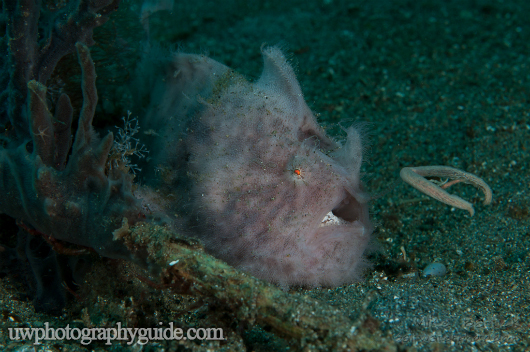 On this particular occasion it was followed with a question, "Have you ever seen a pink frogfish?" 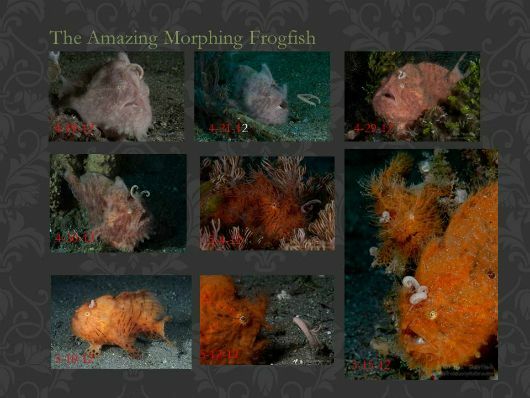 I began to run through the catalog in my mind of all the different frogfish I had seen and photographed. After a few minutes I realized that as a matter of fact, I had not seen a pink frogfish. “But not just pink,” he says, “pink with a 'funny lure. '” This got me interested. I'm the kind of guy who has been known to book plane tickets on such rumors, and this was something we wouldn't even need to go far to investigate. So, we began loading the tanks. We had two reference points to help locate this rumored frogfish, one above water and the other below. The first point was a tree on a shoreline that was crowded with trees, and the second was a stick in the sand somewhere underwater. That all sounded perfectly reasonable to me, so once the tanks were loaded we took off. To the outside world this scenario may sound like a wild goose chase or a needle in a haystack kind of story, but for this underwater photographer it seemed like a no-brainer to investigate. In less than half an hour we arrived in the general area and began scanning the shore. Spotting our first reference point, clue number one, our confidence swelled, we geared up and jumped in. 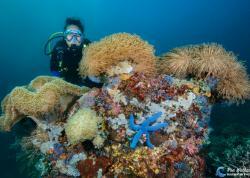 What we discovered were two diverse dive sites in one. There was rubbish on half of the site which provided shelter for loads of critters, then clean sand on the other half, like a line drawn from the shallow end to the deep, clean sand against silt. It was an amazing thing in itself. 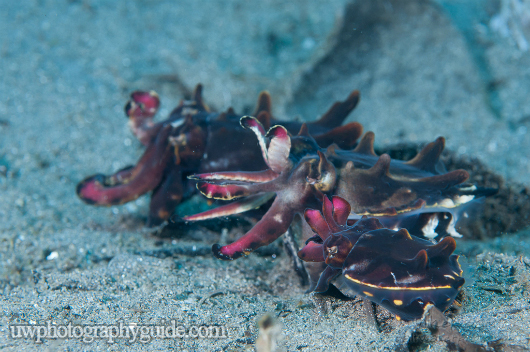 In the first few minutes we were greeted by three flamboyant cuttlefish. Two were large and were accompanied by a very small friend, all actively buzzing around in a mating ritual that was really spectacular to watch. The larger female flushed grey, signaling to the males that it was time for some romance. She extended her tentacles to either side, inviting them in for one-on-one time. The two males jostled for positioning until the female gave up and begin moving away. A few minutes later the same scene repeated itself as the never-ending mating game continued. Then the smaller male backed away to regroup and with all of its energy it charged back in. The larger male positioned himself between the little guy and the female, taking up a defensive posture, but somehow the tenacious little fish got past the larger male for several brief encounters. I always love seeing the underdog win. 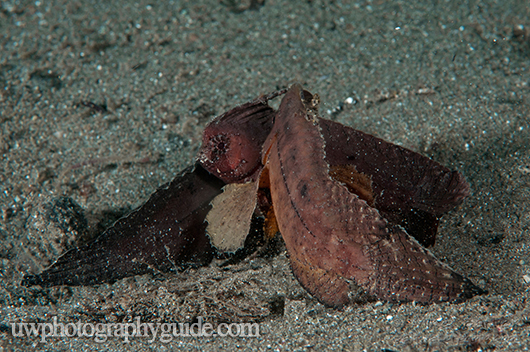 Female cuttlefish in foreground flushes grey, signaling to males that she wants to mate. Small male makes contact with female in a brief encounter. Larger male stands his ground between the female and the smaller male. Smaller male regroups and tries another strategy. Tearing ourselves away from that compelling action we continued on our quest to find the fabled pink frogfish, discovering even more along the way. 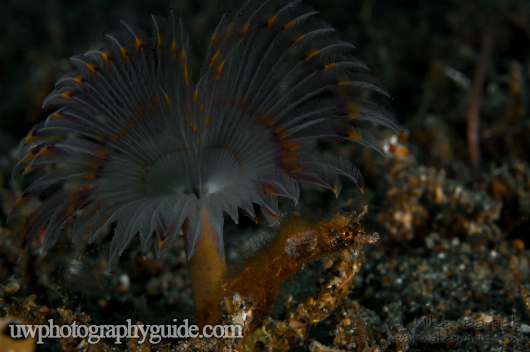 At the deep end of the site I spied a patch of social feather duster worms. Feather duster worms live in tubes that they create out of calcium-based minerals and are very similar to our own bones. When they come out to feed their heads resemble old-fashioned feather dusters, but they instantly snap back into their tubes when alarmed. Hiding within the colony was a beautiful short pouch pipehorse. Seeing these two delicate creatures living together was really unexpected and I was lucky to be able to capture it. Colony of social feather-duster worms and hairy short-pouch pipehorse. Pipehorse feeds from the delicate feathers of the duster worm. The pipehorse wasn’t just living there but also feeding on something on the feathers. It snatched tiny morsels from the duster worms without disturbing it in the least, but when I so much as exhaled too hard the feather duster would retract. 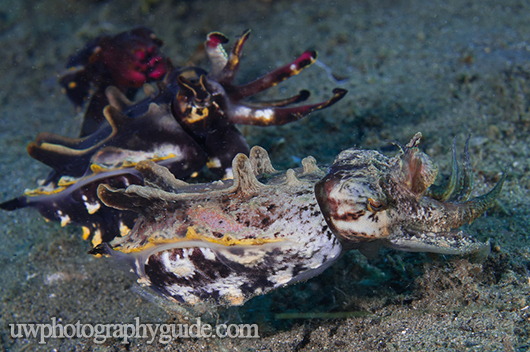 Until recently we had never seen pipehorses in Anilao, but now I know of three different sites that have them. 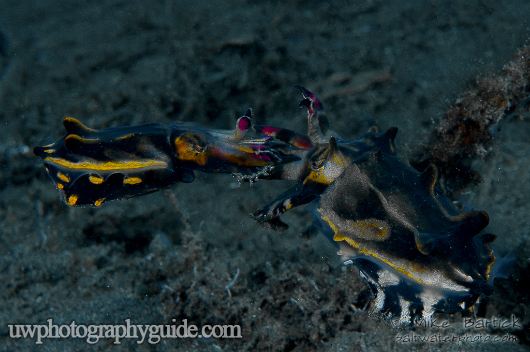 In rapid succession we began to find a whole slew of unusual critters, such as five sets of Ambon scorpionfish and a black finned snake eel with shrimp, followed by a plump and very pregnant seahorse. My shutter finger was working in overdrive. Then my guide tapped my shoulder, pointing at something in the distance. The stick! Clue number two. It turns out that the guide who marked the area used a pair of men’s briefs as a flag so he could find it again, which became a running joke amongst the guides for over a week. After much searching, we found our target... the elusive pink frogfish. But alas, the froggy looked like it was close to death! It was pink-ish all right and it did have a funny looking lure. 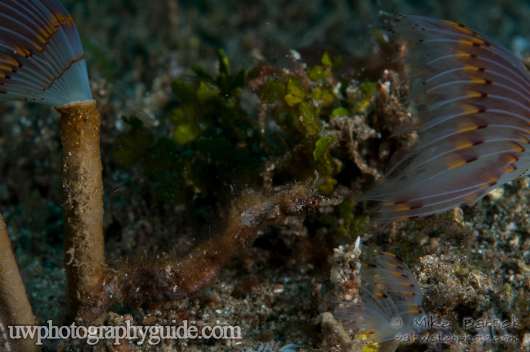 This odd-shaped lure is exclusive to the Antennarious striatus, or hairy frogfish. This pale pink froggy had the markings of a hairy but with very little hair. Later, while reviewing the photos I realized our pink hairy frogfish had a significant piece of its tail section missing. Our find had certainly endured some kind of attack or injury. 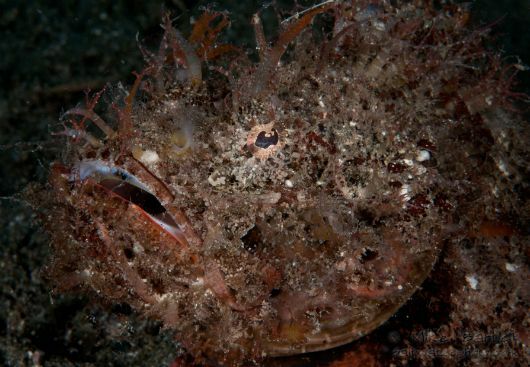 Hairy frogfish spend their lives on the sand, rarely venturing into reef structure. Occasionally they will be found on smaller coral heads near the sand or in soft coral and they especially like hunting the fish living on spiny urchins. The esche, or lure, needs to be a bit oversized to mimic small fish and is very effective when it comes to attracting prey. The hairy frogfish wriggles its lure with the skill of fly fisherman, enticing nearby cardinal fish to have a closer look. Once the cardinal fish is close enough the hungry frogfish strikes and the cardinal fish vanishes. Nothing is wasted as the frogfish’s mouth and stomach opens directly, inhaling the prey whole with nature's fastest strike speed. 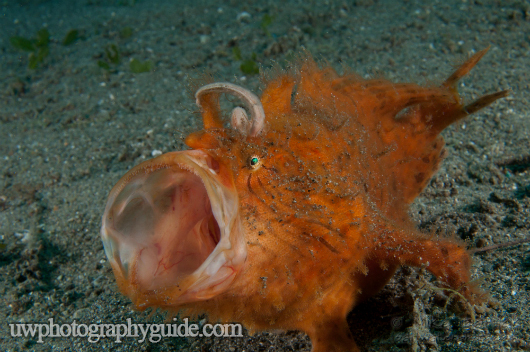 Frogfish regaining her strength, fishing for dinner and beginning a mating cycle. Yawning, very active and photogenic. I watched as our froggy regained its health and funny things began to happen. First it suddenly became plump, signaling to me that it must be a female. Then her colors seemed to be darkening. I know that frogfish change colors but had never actually seen one do it, and I was lucky enough to chronicle the color change and witness an incredible natural wonder. When I found her again, a small and very handsome male had shown up to court her. 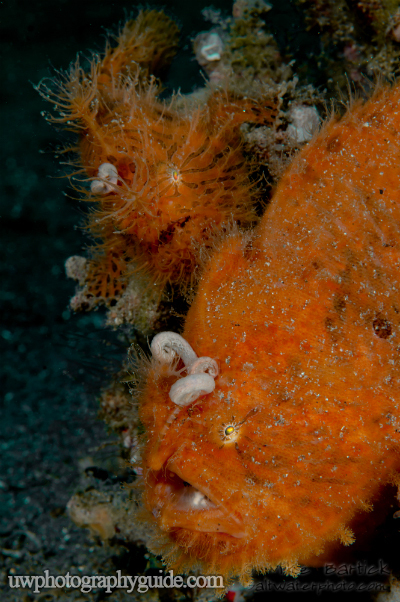 Female frogfish emit an irresistible pheromone that attracts the males when it's time to mate. Females are otherwise dangerously anti-social and have been known to attack and try to eat their suitors! I kept checking back with her, and in the succeeding days her color became a brilliant orange and her markings darkened. As illustrated from the first photo to the last, the color change was amazingly quick. Healthy and colorful, shown here with her handsome male suitor. Mating cockatoo waspfish, Ablanbys taenionotus, marked one of my final dives of the season at a site known as 'coconut point.' I saw these three waspfish swim a few feet off of the bottom cast, spawning and then settling again. I tried to get a photo but they went shy on me. These guys are typically a less gratifying subject to photograph, but it turned out to be an interesting sight. Mating cockatoo waspfish, castspawning and mate blocking; the female is the darker of the three. I swam toward the shallows where my dive began. Once again my guide was looking at me with his tell-all eyes, letting me know there was something else I had to see. 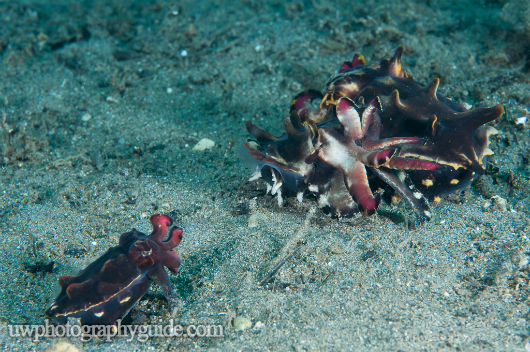 At first sight it seemed to be a common coconut octopus, but looking closer I realized the octopus was doing something very unusual. Most octopi lay eggs and guard them with their lives, attaching the eggs to a rock or in a small crevice and dying when they hatch. 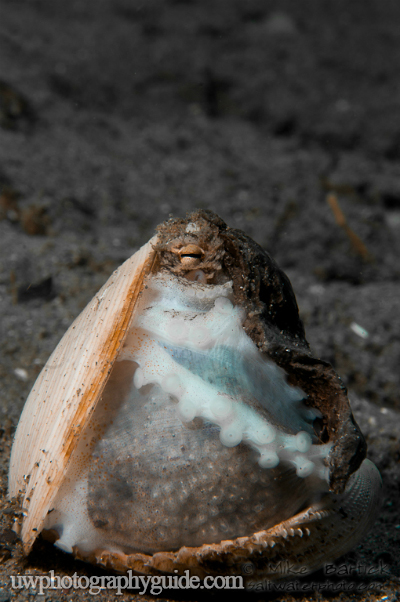 However, this octopus seemed to be brooding her eggs, clutching them tightly together and holding them within the tissue that connects the tentacles. Turned inside out, it was hard to recognize what I was looking at. Every so often she would twist tightly around the eggs and a few of them would escape. I tried to photograph it but it was impossible to know when it would happen. When I saw her move I shot a few frames quickly, hoping that something would show up. I watched as the nearly transparent larvae floated off to begin a new life cycle as drifting plankton. 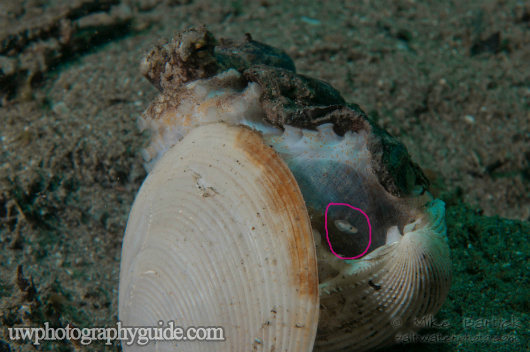 Protecting her young till death, this oscillate blue ring octopus is brooding her eggs. A nearly transparent fry escapes the safety of its mothers grasp. Running short on air, I breathed from my guide’s secondary air source, squeezing off a few last frames before ascending. I sat silently for most of the ride back to the resort, thinking about the incredible experiences we had at the site. I had previously imagined not returning for several months, but as soon as the boat returned my guide and I looked at each other and without a second thought began to load fresh tanks for our night dives. It’s refreshing to know that I’m not the only one with an insatiable obsession for critters. Special thanks to the Crystal Blue Resort and the incredible guides who I worked with. Without their expertise, observing nature like this would be a lot more difficult..
All photos taken with Nikon D300, 110a strobes and 250 pros.